You can change the settings of the Mikme Microphone without the Mikme App. You need use the Mikme settings file builder. Now click on the Mikme settings file builder "Mikme_ini.html" which will open it in your web browser. Please change the Mikme settings according your needs. All three will produce high-frequency, studio-quality sound. And the ideal sampling rate is debatable among engineers. Note that Mikme's default, 44.1 kHz, is already the same sampling rate CDs and high-quality MP3s are produced. Also, know that using a higher sampling rate will take up more space on your Mikme Microphone's internal hard drive. The data will be stored as a .wav file on the Mikme, and must be transferred via USB cable to a computer. 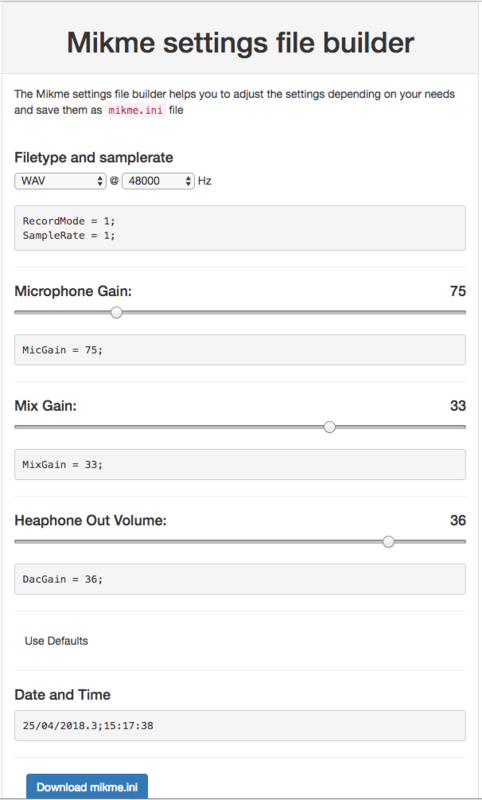 Please be aware that when using the microphone in conjunction with the Mikme iOS App, the sample rate is automatically set to 44.1 kHz and the file type is always m4a.